Yep…new $100 dollar bills (notes) started to circulate yesterday. This project was said to be in development for over 10 years as a joint effort by The Federal Reserve, U.S. Department of the Treasury, U.S. Bureau of Engraving and Printing, and the U.S. Secret Service. First year production is expected to be around 3.4 billion with print facilities in Washington D.C. and Fort Worth, Texas. Some interesting tid bits… More then half of all the new notes printed will end up being circulated outside the United States according to the Federal Reserve. The new note will cost about 12.6 cents each to produce, up from around 8 cents for the old notes. The average life span of a $1 bill is less than 22 months, according to the Federal Reserve Bank of Atlanta; $5 bills last about 16 months; $10 bills last about 18 months; and $20 bills last approximately two years. Lesser-used bills, such as $50 bills stay around for about 4.6 years and $100 dollar bills usually last about 7.4 years (but often longer). Coins last about 25 years or more. 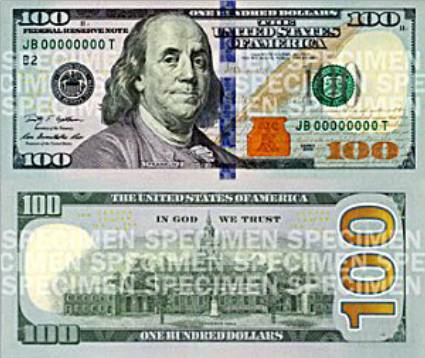 Here are some of the new currency features as described by the Federal Reserve Board: The redesigned $100 note includes two new security features: a blue 3-D security ribbon with images of bells and 100s when tilted, and a color-changing bell in an inkwell. The new features, and additional features retained from the previous design, such as a watermark, offer the public a simple way to visually authenticate the redesigned $100 note.